WhenToWork allows you to send and receive work-related messages. 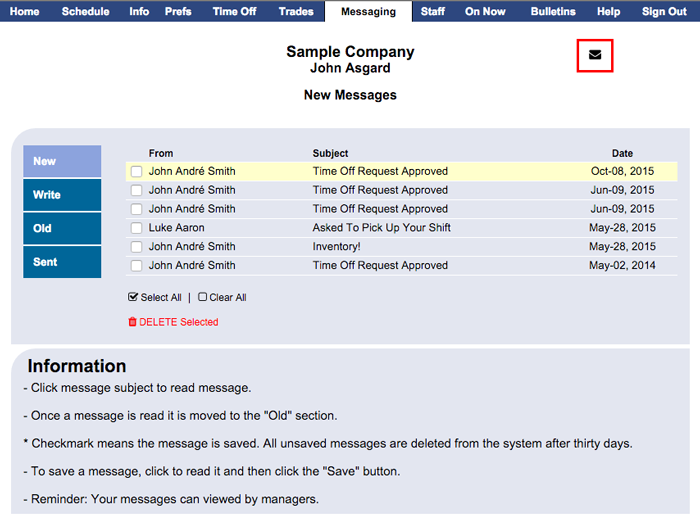 Even if you do not have an email account, you can send messages to your manager or other staff. Note: Your manager(s) can read the messages that you send and receive through WhenToWork. If you or your manager have entered your email address into WhenToWork.com, you will receive a copy of your WhenToWork.com messages by email (You can turn off this forwarding feature in your Info > Notifications section). If you have any new messages, you will see a message envelope icon appear under your Sign Out button in the upper right corner of the pages. You can click this envelope icon or MESSAGING in the top menu to go to the Messaging section. The Messaging section is similar to other messaging programs you may be familiar with - you can read, reply, save, write, and delete messages. If you send a message to someone who has entered their email into our system, they will also get a copy of the message in their email. Note that unread messages are found in the New section. Once a message has been read, it is moved to the Old section. After 30 days, if messages are not marked as Saved, they will be deleted. If you wish to keep them, you may simply click the Save button when viewing the message. To send a new message, click Write and choose who you want the message to be sent to. After sending the message, a copy can be found in the Sent section. Be sure to Save any messages if you want to keep them more than 30 days.